This vegetable is rather common in Japanese food, particularly in oden, a Japanese hotpot soup. I recall last time I was in Japan, I asked what it was and a friend translated it to "devil's tongue" which meant absolutely nothing to me so I wasn't ever clear on what it was. After some Googling, I learned that konjac happens to be a root vegetable. Konjac is gelatinous by nature but less like your typical jello because it's rather dense. I imagine many people are probably put off by that kind of texture. In addition to being an ingredient in oden, it's also often made into noodles that are used in sukiyaki (yet another type of Japanese hotpot). 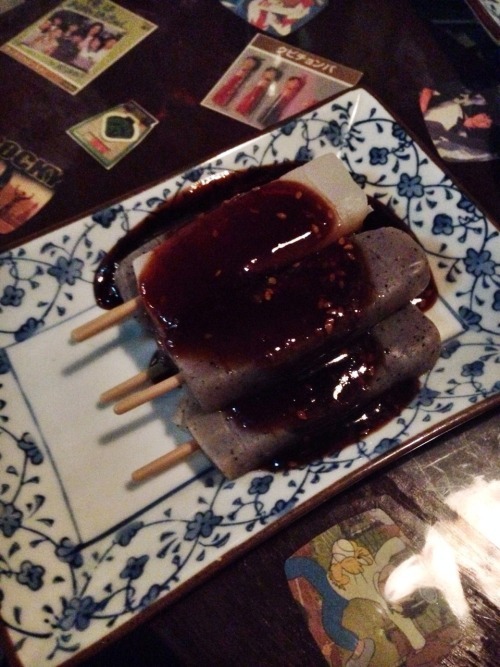 My favorite bar in my city serves konjac on skewers with miso sauce and it's really good! Next is another creepy jelly food so if you're not into those, you've come to the wrong place. 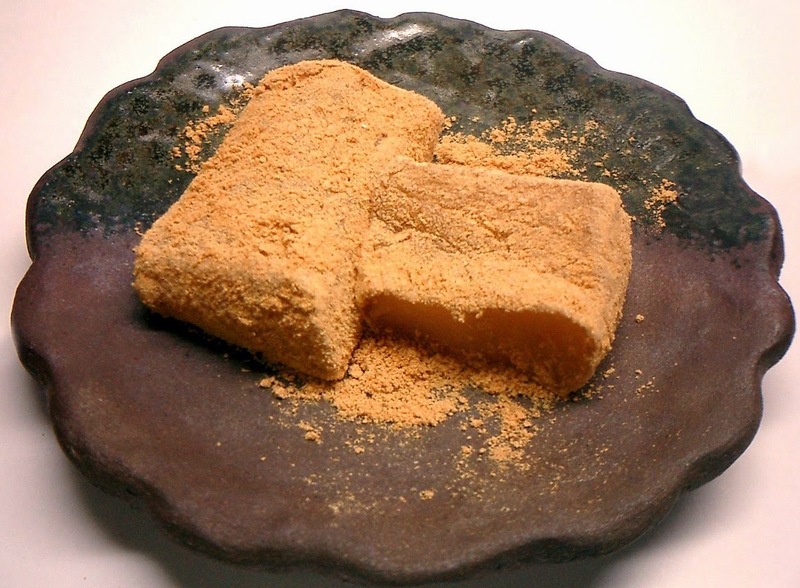 Mochi is the ever popular Japanese rice cake. Many Americans only know it as served with ice cream filling but guess what... it's not as common here in Japan as you think. 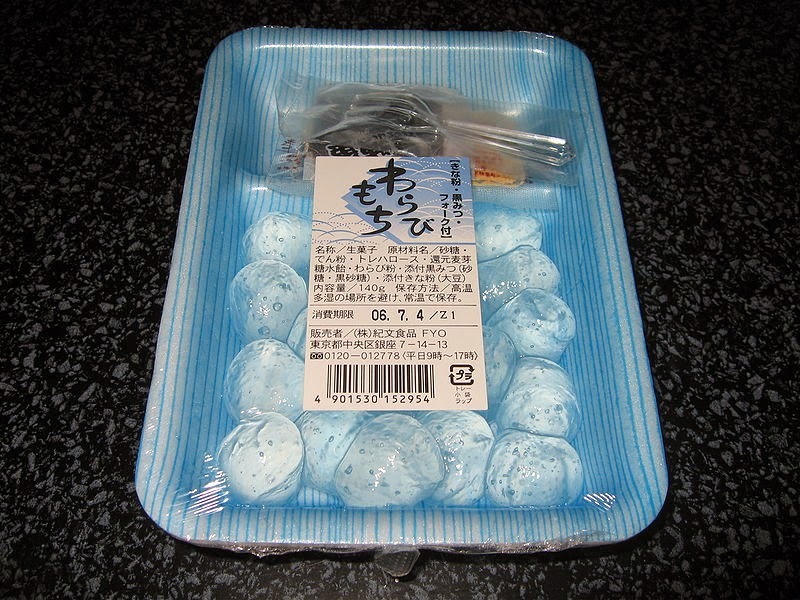 This type of mochi is actually not made of rice, but instead of bracken starch. I'm honestly not entirely sure what that is either but it tastes good to me so I don't really care. It actually looks kind of creepy like frogs eggs but I promise it's really not gross tasting! This is what the one I had looked like when I bought it from the grocery store. The grocery store one came with kinako (soybean powder) and some kind of sweet sauce. It's often sold looking like this one below though so you can't even tell that it's some clear jelly thing. I usually stick to the same convenience store onigiri (rice balls) because sometimes the labels are difficult for me to read. However, my new dictionary app is helping me conquer that so I tried a new flavor- okaka! The name of this probably sounds gross to most people but again, it really isn't a gross thing or else I wouldn't be eating it again and again. Okaka is seasoned bonito (or tuna) flakes. I'm not sure if that made it sound any less strange to you. It tastes smokey and I think it's my favorite onigiri filling now! I recommend trying it if you have the chance. If you ever wanted a sandwich that tasted like pancakes, Japan has granted your wish for you. I ate it cold and the margerine was gross and too much but a friend suggested heating it first. I believe that would help, but I'm not sure I'm ready to try this one again honestly. Japanese candy is the best candy! This is a new one I tried and I can't even properly describe what it is. It has a chocolatey center with a flavored candy outside but it's not hard like a M&M is. The strawberry one is my favorite. I don't know why it's called Galbo Mini or if there is even a Galbo Large counterpart... If there is, I want to know about it because these are soooo small and I always want more than what comes in the package. I had never even heard of ojiya until I tried it on Tuesday. My friend Elleanor works at a socks store called Circus in Harajuku and I visited her at work. My friend Megan and I went next door to an ojiya restaurant with her during her lunch break. Ojiya is a Japanese rice porridge type food but the cafe referred to it as "risotto" which may be a more accurate translation. Megan and I split a plain one (you can choose to add toppings though) and we liked it a lot. This is what it looks like but I don't have a picture of the exact one I ate. It came with seaweed, a sausage that looked kinda like an octopus and a fried piece of bread that had some sugar on it. That's it for this post. I have a few other post ideas in mind. I think my next one might be about my favorite Japanese Harajuku fashion icons. As always, any questions or blog post suggestions are welcome both in the comments and over here at my ask.fm! Also the rice porridge looks good pretty much a grits type thing huh haha I bet with cheese itd be amazing!! Can't wait for the next blogpost!! Hhaha it is like thick mucus it's true. This one is kind of more like tapioca, I think!